Nasr Rahme SAL is a family agricultural company established in 1987 by Mr. Nasr Rahme. It is mainly specialized in growing potatoes and onions in the Deir El Ahmar Valley in Lebanon. The unique environment of the Deir El Ahmar Valley in the north western part of the Bekaa provides nearly perfect growing conditions for potatoes and onions. 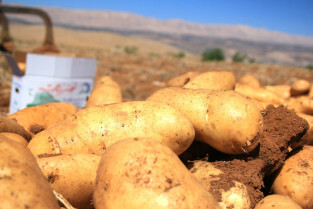 The soil, water, clean air and climate here in Deir El Ahmar Valley contribute to those consistently high-quality potatoes and onions that have made our brand name famous for so many years. Warm, sunny days, cool nights and the water from melting snow in nearby Al-Makmel Mountain make the perfect combination for growing the nation’s best potatoes and onions. With over 200 employees, our company is producing more than 10,000 Tons of fresh potatoes and 4,000 tons of fresh Onions per year. Our products lead the table potato and fresh onion market in quality and flavor. Our healthy plants are a result of more than just good environmental conditions. They are provided with healthy soils for optimum root and plant development. As for healthy soils, it is achieved through a careful balance of numerous enzymes, microorganisms, nutrients, organic matter and pH. Together they create an optimum balance, which maximizes the nutritional value, flavor and appearance of our produce. More than 70% of our produce is exported to neighbor and gulf countries like: Syria, Jordan, Saudi Arabia, UAE, Kuwait, Qatar, OMAN and others. Our local Lebanese market is mainly to the restaurants and hotels, as well as the major supermarkets. Nasr Rahme SAL is a member of Global GAP as it has received its certification for Good Agriculture Practice, another proof of excellence in quality of our produce.With over twenty years of successful experience and efficient manpower, Nasr Rahme SAL has the capability to expand its production volume based on local and regional demands. We aim to explore new markets and especially in north Africa and in Europe.